WTA (Wirbelschicht Trocknung Anlage) technology for drying of lignite coal has been developed by German company RWE Power AG. WTA is the German abbreviation which stands for fluidized-bed drying with internal waste heat utilization. RWE Power AG holds a good number of patents on this technology. The first steam-fluidized bed dryer was developed by RWE as the WTA-1 demonstration plant at Frechen near Cologne, Germany, with a throughput capacity of 53 tons per hour of raw lignite coal having a grain size of 0 mm to 6 mm and an evaporative capacity of 25 tons per hour. During the 20,000 hours of test operation from 1993 to 1999, the WTA-1 demonstration plant along with the vapour compression system for drier heating (employed for the first time worldwide in lignite coal applications) has proved to work extremely well and reliably. Further theoretical work and an evaluation of the test operation of the WTA-1 plant revealed further potential for the technical and economic process optimization. Several alternatives of development were considered and it was revealed that a reduction of the grain size held most potential for further improvement. In 1999, RWE built a test plant called WTA-2 for the fine grained WTA process directly next to the WTA-1 plant in Frechen. This new plant had a design capacity which was increased in several optimization steps from originally 16.4 tons per hour of raw lignite coal throughput and 8 tons per hour evaporation capacity to a raw coal throughput of 28.7 tons per hour and a water evaporation capacity of 13.1 tons per hour during the total of 8,200 hours of operation of the plant by 2011. Based on the extensive experience from the operation of the WTA-2 plant with a range of lignite coals from the Rhenish Lignite District, RWE decided in 2005 to build the commercial size WTA prototype plant at the Coal Innovation Centre at Niederaussem. The design capacity was 210 tons per hour of raw lignite coal throughput, 110 tons per hour dry lignite coal and the evaporation capacity was 100 tons per hour. This represented a scale-up step of a factor of more than 8. The plant was designed as a production plant with industrial type process control system and safety features. It was erected between 2006 and 2008, and the first raw lignite coal was dried in December 2008. As an alternative to the design in Niederaussem, all components of the main coal flow can also be installed above one another in a steel structure. Presently this technology is working at the 1000 MW capacity Niederaussem power station. The system, which can process 210 tons of raw coal an hour, has an evaporation capacity of 100 tons of water per hour and is the biggest lignite drying plant in the world. It can generate 110 tons of dry lignite an hour. Lignite coal is normally converted into high quality solid fuel while processing it to make gaseous and liquid products. For this processing, the moisture content is required to be reduced to 10 % to 20 %. Being a basic process technology operation, drying of the lignite coal upgrades the quality of the lignite coal as well. An energy efficient drying method improves the energy balance of the overall process. As a modern method for processing and drying of the lignite coal, WTA technology is used and adapted to all of the above processes. It makes a vital contribution for the optimizing of the entire process of utilizing lignite energetically, and for the lowering of the emissions. As the energy input for drying rises with the increase in moisture content, efficiency improvements achieved from WTA technology are not a constant value. The higher the moisture content is to be removed, the greater is the potential for improving efficiency. The flue-gas emission associated with the generation of power generation is directly proportional to the amount of fuel input and to the efficiency of the power plant. The increase in efficiency from WTA technology directly helps in lowering of this emission. In conventional drying of the lignite coals, the coal is dried using hot flue gases, which are drawn from the steam generating boiler furnace at a temperature ranging from 900 deg C to 1,000 deg C and directed to the grinding mills for grinding. There, the hot flue gases withdraw much of the moisture from the lignite coal while it is being pulverized. If this combined process is decoupled and separated into drying and grinding, the lignite coal can be dried at a low temperature with greater energy efficiency. Pre-drying of the lignite coal can increase the calorific value (CV) to such an extent that it can be used for combustion in conventional steam boiler without any back-up fuel. Steam drying of coal is a drying method which has been consigned to a niche existence in coal drying till a few years back. In 1979, Potter et al. have taken up the principle of steam drying and shown in laboratory tests that lignite coals can also be dried in a stationary fluidized bed using slightly superheated steam. 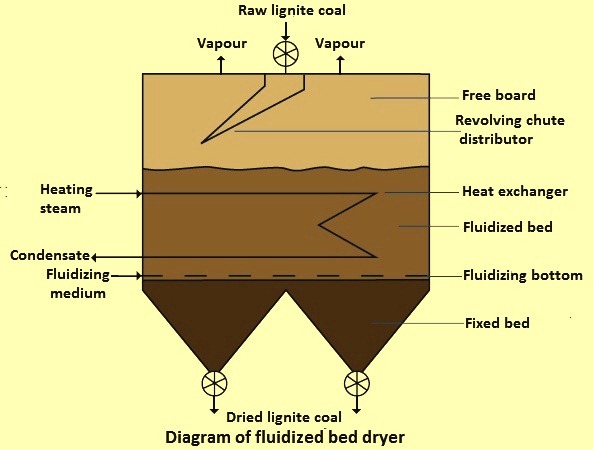 Two aspects make steam drying of lignite coal very interesting. The first one is the necessity to remove a large amount of water from the raw lignite coal which is of the order of half a ton of water for every ton of raw lignite coal. The second aspect is the fact that lignite coal behaves hygroscopically which means that the moisture content in the lignite coal equilibrates with the surrounding atmosphere and, for a given lignite coal, it is only the function of the pressure of water vapour and the temperature. During the drying of the lignite coal in pure steam at constant pressure, say atmospheric pressure, then the equilibrium moisture is only a function of temperature. The curve describing this relationship is known as the desorption isobar. This is of particular interest from a process control perspective, since the moisture of the dried lignite coal does not depend on the drying time, provided that the lignite coal is dried long enough to have equilibrated with the steam atmosphere. Also, the lignite coal cannot be ‘over-dried’, since the moisture content no longer changes, once equilibrium is reached, regardless how long it is kept in the dyer. The desorption isobar depends on the quality of the lignite coal. This dependence for two types of lignite coals at a system pressure of around 1.1 atmospheres is shown in Fig 1. 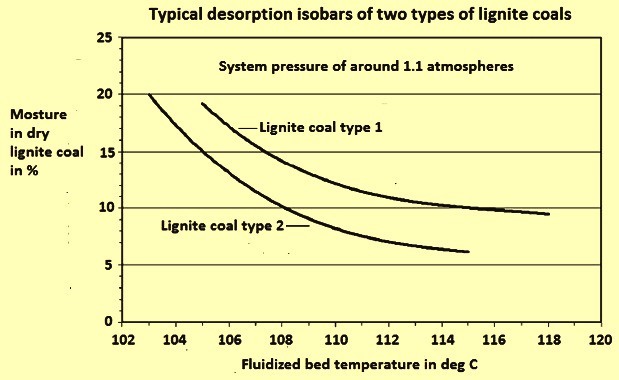 The Fig 1 shows that an equilibrium moisture content of around 12 % is reached in lignite coal of type 1 at a temperature of around 110 deg C, while in coal of type 2 it is reached at a temperature of 107 deg C.
There are the following advantages of the use of steam for the drying of the lignite coals. Drying is carried out in an inert atmosphere which ensures a high degree of natural safety for the potentially explosive characteristics of the dry lignite coal. The moisture content of the dry lignite is simply a function of temperature at the constant pressure. The drying temperature is comparatively low. Almost 100 % of the drying vapour consists of steam, so that it condenses isothermally. It is thus an attractive source of waste heat which can be used actively in a sensible way. The condensation of the vapour avoids large volume of steam emissions and dust emissions. The condensate recovered is an utilizable source of water which can contribute to meeting the water requirements of the plant. The raw lignite coal is ground down to a size less than 2 mm in two grinding mills directly connected in series. After the grinding, the coal is fed into the fluidized bed dryer, in which the fluidizing medium is the vapour arising from the drying process. Evaporation of water occurs at 110 deg C under slight over-pressure by heat exchangers integrated into the fluidized dryer and heated with steam. The residence time of lignite coal in the drying chamber is in the range of 60 minutes to 90 minutes. The dried coal leaving the stationary bed is separated from the accompanying vapour first in a cyclone and then in an electrostatic precipitator. The vapour at the outlet of the cyclone is the vapour used for fluidization of the bed and the vapour at the outlet of the electrostatic precipitator is discharged into the atmosphere. In addition, there is a coarse extraction for the coal at the bottom of the bed, which is mixed with the coal separated at the cyclone and the electrostatic precipitator after having passed an intermediate cooler. The heat needed for the drying of the coal is supplied by external steam, which is normally taken from the turbine with the heat transfer taking place in tube bundles located inside the bed. The drying in the fluidized bed further reduces the grain size, so that the dry coal leaving the drier typically has a grain size of less than 1 mm with around 9 % more than 1 mm. The dried coal has a moisture content of around 12 %. By controlling the fluidized bed temperature, the moisture content can be adjusted and kept constant at the desired value. WTA process is an important technology for the reduction of the CO2 emissions in lignite coal based electricity generation. The lignite coal is fed via a star feeder to the dryer, which is under slight over-pressure. A system which is specially developed for WTA technology is installed in the upper section of the dryer. It distributes the pre-ground raw lignite coal across the surface of the fluidized bed. The fluidized bed is heated by low-pressure steam or, depending on the process alternative, by recompressed vapour. This is the vapour which emerges when drying of the lignite coal. The pressure of the heating steam is around 3 to 4 atmospheres. For swirling (fluidization), the system used is adapted to the specific conditions of drying of the lignite coal. Below the fluidizing bottom, the dry lignite coal is discharged from the fixed bed via star feeders. The dryer has a high specific capacity and a compact design. The fluidized bed dryer is shown in Fig 2. WTA process technology is based upon utilizing the principle of a stationary fluidized bed with low expansion at slight over-pressure. This is a bed of solid particles which is converted into a ‘floating-to-flowing’ state by an upward flow, generally of air. The energy needed for drying is supplied via heat exchangers installed in the fluidized-bed dryer which are heated with steam. Only a small amount of energy is supplied through the fluidizing medium. Hence the fluidizing flow and the energy requirements of the dryer can be controlled independently of each other. The heat transfer between the heat exchangers and the fluidized bed is very good and the high heat flow can be achieved even with small temperature differences. As a result, dryer in spite of having a compact design has a high evaporative capacity. Also, since the raw lignite coal after its grinding is practically impossible to fluidize in bulk due to its cohesive properties, the fluidized bed is generally designed as a mixed bed of dry lignite coal as carrier medium with freshly ground raw lignite coal added to it. Drying is carried out in nearly 100 % pure, slightly superheated water vapour atmosphere. In the process, equilibrium is reached at a constant pressure between the temperature of the steam concerned and the residual moisture in the lignite coal. The advantage of drying of the lignite coal in a vapour atmosphere is that the evaporated water of the coal condenses isothermally, i.e. at a constant temperature, so that it can be used in an energetically efficient manner. Two concepts for vapour use have been developed at the industrial scale, These are (i) mechanical vapour recompression as open heat-pump process to heat the dryer’s heat exchangers with and without integrated lignite coal pre-heating (Fig 3b), and (ii) vapour condensation for preheating of, e.g., boiler feed water in the power-plant process, as implemented at Niederaussem (Fig 3a). The two variants can be integrated into the WTA process. They increase the energy efficiency of the drying process and reduce emissions. The vapour condensate produced can be used as industrial water. The choice of the system employed for the utilization of the vapour depends, among other things, on the drying requirement and on the integration into the overall process. WTA drying process has been developed for two input grain sizes namely (i) the coarse grain size (0 mm to 6 mm), and (ii) the fine grain size (0 mm to 2 mm). The coarse grain size alternative is used if the downstream process needs dry lignite coal of a minimum grain size, such as gasification in the high temperature Winkler process or the coking of lignite coal. For all other processes, the fine grain size alternative is normally used since it is much more attractive option both technically and economically. Specifically as a pre-drying stage in the conventional power station, the fine grain size WTA process is advantageous, since the dried lignite coal of 1 mm maximum grain size is so fine that it can be used in the boiler directly as fuel. For the necessary direct fine grinding of the run-of-mine lignite coal, RWE has developed a special process with two grinding stages connected in series for the reduction of the grain size of the raw lignite coal from around less than 80 mm to the desired value of less than 2 mm. 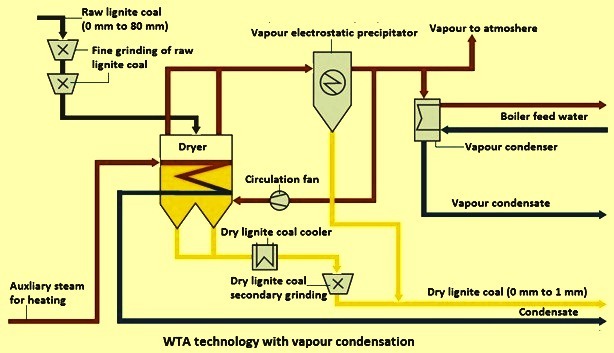 Fig 3b shows the overall process of fine-grain WTA process alternative with upstream fine grinding and integrated mechanical vapour compression for using the vapour energy in the drying process. The evaporated coal water (vapour) is cleaned in an electrostatic precipitator and re-compressed in a compressor to around 4 atmospheres, so that the water vapour can be used to heat the heat exchanger installed in the dryer (Fig 3b). The sensible heat of the vapour condensate is used to pre-heat the raw lignite coal to around 65 deg C to 70 deg C. Hence, the energy from the vapour is utilized to cover the energy needs of the dryer. Some of the cleaned water vapour is recirculated to the dryer for fluidization of the raw lignite coal. The dry lignite coal is cooled if necessary and ground again, using a grinding mill integrated into the WTA plant, to a grain size of less than 1 mm, so that it can be used directly for combustion in the boiler of the power plant. The vapour coming from the dryer can also be used to preheat the boiler feed-water in a power plant’s water-steam cycle. Also feasible is a low cost alternative (Fig 3c) without use of the water vapour. This alternative can be installed to improve the CV of the lignite coal with high moisture and ash. The WTA process is marked by high specific capacity and low heating steam pressure. Hence, very high drying output can be achieved for each of the dryer unit. Further, the space-saving design and the integrated fine grinding system for the raw and dry lignite coals, the entire plant also remains relatively compact. The following are the advantages of drying of the lignite coal utilizing WTA technology. High energy efficiency because of drying at low temperature, and energetic use of the evaporated coal water either through vapour condensation or mechanical vapour compression. A highly safe technology in operations because of drying in an inert atmosphere. This avoids explosive mixture of coal dust and air. The dryer unit has high drying capacity. The design is compact because of integrated raw lignite coal fine grinding system and where needed secondary dried lignite coal grinding as well. Utilization of the energetic vapour avoids significant steam and dust emissions. The vapour condensate is a water source which can be used in the plan. The plant engineering can be flexible with respect to the needs of the drying requirements. The technology increases the power plant efficiency by 4 % to 6 %, depending on the drying alternative and the moisture content of the raw lignite coal.